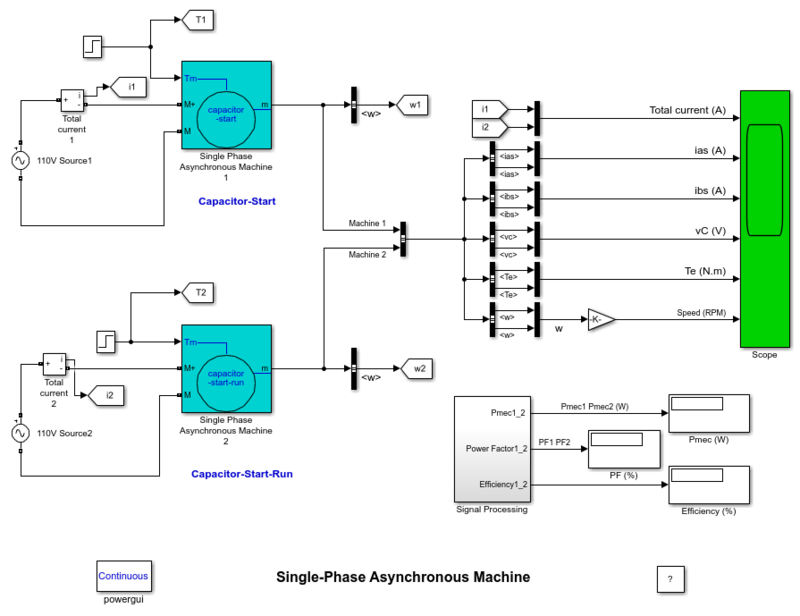 This example shows the operation of a single phase asynchronous motor in Capacitor-Start and Capacitor-Start-Run operation modes. 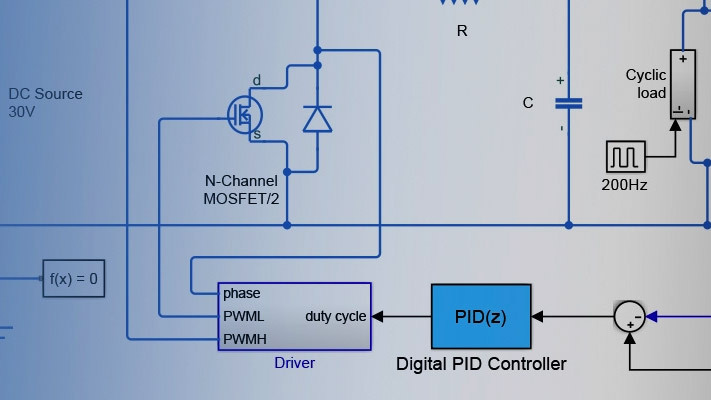 This model uses two single-phase asynchronous motors respectively in Capacitor-Start and Capacitor-Start-Run modes, in order to compare their performance characteristics, such as torque, torque pulsation, efficiency and power factor. The two motors are rated 1/4 HP, 110 V, 60 Hz, 1800 rpm.and they are fed by a 110V single phase power supply. They have identical stator windings (main and auxiliary) and rotor squirrel cages. Motor 1 motor operates in capacitor-start mode. Its auxiliary winding, in series with a 255 uF starting capacitor, is disconnected when its speed reaches 75% of nominal speed. The starting capacitor is used to provide a high starting torque. Motor 2 operates in capacitor-start-run mode. This operation mode uses two capacitors: The run and start capacitors. During the starting period, the auxiliary winding is also connected in series with a 255 uF capacitor but, after the disconnection speed has been reached, the auxiliary winding stays connected in series with a 21.1 uF run capacitor. This capacitor value is optimized to mitigate torque pulsations. The motor operates efficiently with a high power factor. The two motors are first started at no load, at t=0. Then at t=2 sec, once the motors have reached their steady-state regime, a 1 N.m torque (nominal torque) is suddenly applied on the shaft. Start the simulation. The Scope block displays the following signals for the capacitor-start motor (yellow traces) and capacitor-run motor (magenta traces) : total current (main +auxiliary winding), main winding current, auxiliary winding current, capacitor voltage, rotor speed and electromagnetic torque. The mechanical power, power factor and efficiency of motor 1 and motor 2 are computed inside the Signal Processing subsystem and displayed on 3 Display blocks. During the starting period, as long as the disconnect switch remains closed (from t=0 to t=0.48 s), all waveforms are identical. After opening of the switch, differences are observed as explained below. Observe the 120 Hz torque pulsations which produce 120 Hz mechanical vibrations of the rotor and decrease the motor efficiency. Peak to peak torque ripple is about 3 N, or 300% of rated load when the motor is operating at no load. Observe that the starting capacitor remains charged at its peak voltage when the auxiliary winding is switched off. Observe that the torque pulsations are substantially reduced. The run capacitor value has been optimized to minimize torque pulsations at full load. Torque pulsations magnitude is 2 N.m peak to peak (200 % of rated torque) at no load, while it is only 0.04 N.m peak to peak (4 % of rated torque) at full load. Power factor and efficiency at full load (respectively 90 % and 75%) are higher than with the capacitor-start motor (respectively 61 % and 74 %).